The January readings for the EMU on the EU Commission indexes show ongoing weakness. The overall EU index now resides in the 72nd percentile of its historic queue of data, a reasonably firm and comfortable reading but not an especially strong reading. The index has been stronger about 28% of the time. The sector indexes show a clustering in the rankings for the industrial sector, retailing sector, and consumer confidence around a queue standing in the 70th percentile. Services have a much more moderate 55th percentile standing, leaving the sector only slightly above its historic median. The construction sector, with a ranking in its 99.7 percentile, is this strong or stronger only 0.3% of the time. In fact, this is the highest construction reading on record, tied with the readings it has had in recent months. Construction is the only sector index that is gradually scaling higher. All other sectors have been steadily losing momentum (see Chart). The loss in momentum for economic sentiment is widespread. It is not just the setback in sectors. In January, three of five sectors weakened with construction and consumer confidence actually bucking the trend by improving on the month. In December, four of five sectors eroded. In November, one sector eroded one improved and the rest were unchanged. By looking at the indexes for member countries, the move to weakness is remarkably clearer. Of 18 reporting members, all but five show month-to-month erosion in their overall sentiment indexes in January. In December, all but seven members registered circumstances that had eroded. In November, eight improved and one was unchanged, leaving nine countries with overall index erosion. The weakness fluctuates between being widespread and preponderant. Only five countries log queue standings in the top 20% of their historic queue of values and of them only Cyprus is in the top 10% of its historic queue. Germany and Portugal are the largest countries with top 20th percentile rankings. On the other hand, seven EMU members have rankings in their historic 50th percentile range; this list includes France, Italy, and Spain. Meanwhile, Greece, Belgium, and Slovakia have queue standings below their respective 50th percentile mark, indicating an index that is below its historic median. These metrics clearly identify a lot of weakness in the EMU region and not much counterbalancing strength. The industrial sector finds the four largest EMU economics each encountering slippage in January. Over the last four months, each of them is weaker on balance as well. For the industrial sector, the overall the production trend is weak and has been weaker only 40% of the time. Production expectations have a 55th percentile standing, barely above their median. 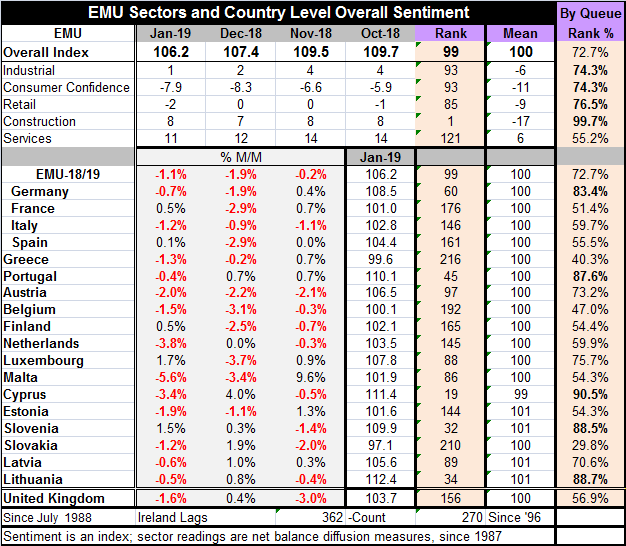 The services sector slipped in two of the four largest EMU economics in January and it is lower on balance over four months in three of four of them with France an exception despite the Yellow Vest protests. However, none of the big four economies have a strong ranking services sector. In France, the rank standing is in its 52nd percentile, leaving it just above its historic median. Spain’s services sector has a very weak 39th percentile standing. Germany and Italy post mid-60th percentile standings- readings that are moderately firm. The business climate in services has a 47th percentile standing, below its median. Current employment is just under a 51st percentile standing, barely above its median. It’s a mixed bag of mediocrity and weakness. Consumer confidence readings have been trending, sagging, everywhere except in Greece, there, confidence continues to improve but from extremely low readings. On the month, however, confidence did improve. Some of that is due to still very low fears of unemployment, fears that have been even lower only about one-third of the time historically. While many consumer responses in this survey are quite strong, the economic situation for the next 12 months has only a 59th percentile standing. The four largest economies have a queue standing for confidence in their respective 70th percentiles or higher except for France where its reading is below its median with a 42nd percentile standing. Europe continues to show spotty growth. France today issued its GDP reading for Q4 2018 which showed a gain of 0.3% q/q (not annualized), the same as for Q3. Growth is still in gear and it is not at all clear whether growth is even at risk. There is some definite and widespread slowing in Europe. But economies do speed up and slow down. Every change in momentum does not necessarily take us to a new cycle peak or to a new trough. Mario Draghi has said that the ECB stands ready to turn QE back on if it is needed. Whether that reassures onlookers or frightens them, I do not know. There continues to be a lot of scattered country level weakness reported and not all reports are simply weaker, but it is weakness that is the dominate news. German preliminary inflation data for January continue to show inflation is in check in that country despite its low unemployment rate. Meanwhile, the same geopolitical themes continue to play out. It is difficult to say what comes next in the U.K. Brexit situation. In the U.S., the official spymasters in testimony refuted some of the basic ideas being promoted by President Trump pertaining to his policies in Iran and North Korea. The U.S. political situation is still best described as being at an impasse with a certain balance of power leading to policy stagnation and the lack political trust ready to turn things even worse. Meanwhile, U.S.-China trade talks are restarting. There are any number of things in the mix that are important and could make news and affect global economic conditions. Fortunately, today’s Fed meeting is not one since no policy change is expected although we are always at risk when central bankers speak - and Chairman Powell has a press conference today.